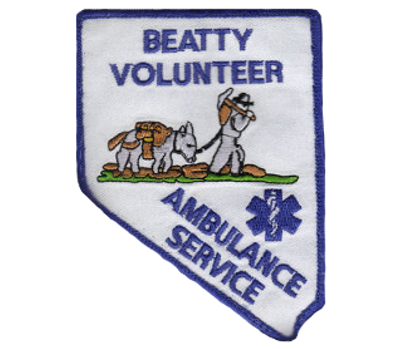 In September of 1993, the Beatty Volunteer Ambulance Service was formed as a separate entity. Prior to the Ambulance service merging with the Fire Dept. finding ambulance crew members to make long transports with critically ill patients was a challenge. First aid and advanced first aid classes were available but not mandated. It wasn't until 1976 that an EMT program became available in Beatty. By 1980 EMT Licensure was needed. Now connected with the Nye County Emergency Medical Services, the EMT's possess a total of 144 years of dedication and experience. This service has a total of 12 volunteers from every walk of life.